The new BOP Engineering One-piece rear mail seal is the most advanced rear main seal on the market for the traditional Pontiac V-8. This revolutionary design features a number of state of the art innovations including relocation of the parting line which greatly reducing the risk of leaking, a more pliable construction that will work more effectively in engines with seal groove geometry issues, and double lip design to provide twice the protection against leakage as well as supporting outstanding vacuum numbers. With the mandated removal of asbestos from the factory type rope seals, increased leakage has become commonplace. To address this problem BOP Engineering has designed a rear main seal for the traditional Pontiac V-8's. These seals are not a retrofit from some other engine, but designed from a clean slate using state of the art technology and the best materials. Testing has shown a significant reduction in drag over the factory rope seal, and no leaks! Available in both 3 main size 301 - 400 engines and small journal aftermarket blocks, and for 3 1/4" main size 421 - 455 engines and large journal aftermarket blocks. Do not be fooled by Imitations! 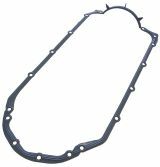 The BOP one piece oil pan gasket works with ALL Pontiac V-8's '59-'81. The rear cap area cross-section is square like the cork so it fits perfectly into the main cap with the groove ('59-'72). We added the tabs ('73-'76) and most after mark et pans Canton , Milodon, etc.) This design should not be confused with the normal 3 tab design that has a curved bot tom and is notorious for slipping out of place. This will also work on the 5 tab pans ('77-'81) with minor pan slot modification or removal of tabs. If your pan does not have the 3 tab slots ('59-'72) you can cut the m off with a razor blade. If it does you have the benefit of double holding power. Silicone/sealer is only recom me nded at he bend points of the timing cover and where the rear curve me ets the block to account for any minor align me nt discrepancies. This is a well engineered part that is quick, clean, reliable, and reusable. You will not be disappointed. Keep the oil off of your crank with this nice reproduction of the factory ¾ length windage tray. This cadmium plated tray is constructed of 17-gauge steel (thicker than the stock) with strategically placed oil drain holes for better oil return. Tray bolts to #2 and #4 main caps. Replace your rusted, dented, bent, or full of sand from blasting, valley cover with this beautiful silver nickel cadmium plated reproduction piece. Pan will clear roller lifters and has improved baffle design. Can easily be painted. **Not for use w/ EGR Intakes, Tri-power, or 301 engines. Replace your rusted, dented, bent, or full of sand from blasting, valley cover with this beautiful reproduction piece of a stock 2-piece design for 1964-67. Also fits 61-'63 389 & 421 but not stock appearing. Pan has plain steel finish and can be painted. PCV & grommet not included. **Not for Use w/ EGR Intakes or 301 engines. The BOP Carbon Fiber Valley pan is the ultimate! Super Rigid and weighing in at only 11 oz, this pan replaces the original stamped steel pan and will allow the use of roller lifters with no modification. Pan includes bolts & gasket. Not for Use with EGR Intakes. The BOP aluminum valley pan replaces the original stamped steel pan and will allow the use of roller lifters with no modification. Pan includes bolts, PCV grommet. 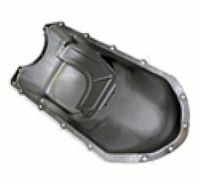 Double baffle design incorporated in PCV provision eliminates oil consumption through PCV valve. Not for Use with EGR Intakes. PVP41 will not fit Tri-power intakes. Pontiac stock replacement oil pan with baffle. Available unplated or Zinc plated, paint to match. Works great with OPG49 One-Piece Oil Pan Gasket!